Seraphina is unlike any other book that I've ever read. The world building was absolutely incredible. Hartman leaves a large amount of descriptions throughout the book which really helped me visualize the setting. I enjoyed the conflict between the dragons and humans in Goredd. The politics and social structure that were involved were also very well thought out and made sense in the context of the story. Even though most of the time I appreciated all of the descriptions, the book did feel a little slow at times. I definitely think this is due to Seraphina being the first book in the series and a lot of time needed to be spent thoroughly developing this new world. I liked how the main character, Seraphina, was flawed yet had redeeming traits like independence, kindness and strength. I thought it was interesting how she dealt with her secret, I absolutely adore her 'mind garden' and can't wait to read more about it in the sequel. One of my favorite bits was the adventure! Yes, there were definitely parts that were slow, but the adventurous action scenes made up for it. I also really loved the supporting characters and seeing them interact with our main character. I'm still a on the fence if the little bit of romance was forced/necessary or not, but I'm really curious to see where that goes in book two. "I cannot perch among those who think that I am broken." 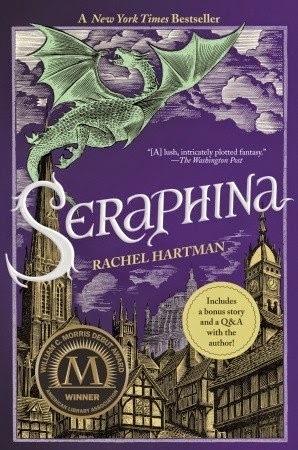 Although there were some slow parts, I really enjoyed the world of dragons and humans that Rachel Hartman created in her debut Seraphina. I'm looking forward to following Seraphina on her adventures in the second book, Shadow Scale. **I received this book for review from Random House in exchange for an honest review. All thoughts and opinions expressed are my own.